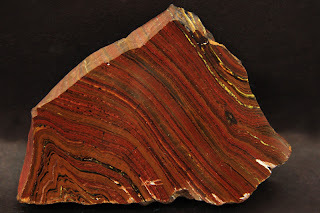 Banded iron formations (BIFs) are chemically precipitated sedimentary rocks. 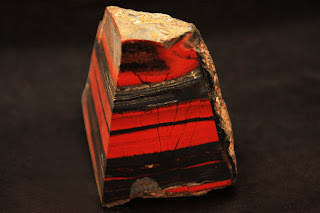 They are composed of alternating thin (millimeter to centimeter scale) red, yellow, or cream colored layers of chert or jasper and black to dark gray iron oxides (predominantly magnetite and hematite), and/or iron carbonate (siderite) layers. 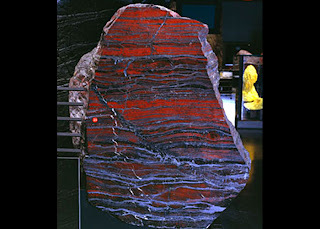 Banded iron formations have greater than 15% sedimentary iron content. 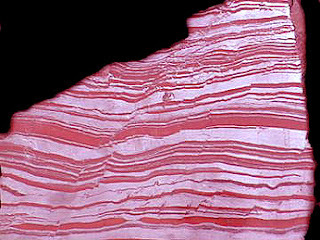 Banded iron formations are of economic interest as they host the world’s largest iron ore deposits and many gold deposits. 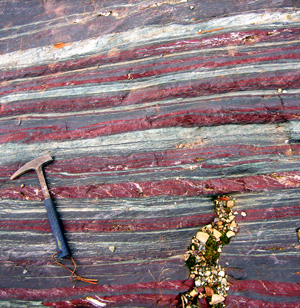 Algoma-type banded iron formations were deposited as chemical sediments along with other sedimentary rocks (such as greywacke and shale) and volcanics in and adjacent to volcanic arcs and spreading centers. Iron and silica were derived from hydrothermal sources associated with volcanic centres. Algoma-type iron formations are common in Archean green-stone belts, but may also occur in younger rocks. 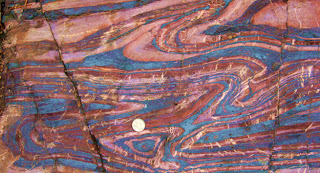 Lake Superior-type banded iron formations were chemically precipitated on marine continental shelves and in shallow basins. They are commonly interlayered with other sedimentary or volcanic rocks such as shale and tuff. Most Lake Superior-type banded iron formations formed during the Paleoproterozoic, between 2.5 and 1.8 billion years ago. Prior to this, Earth’s primitive atmosphere and oceans had little or no free oxygen to react with iron, resulting in high iron concentrations in seawater. Iron may have been derived from the weathering of iron-rich rocks, transported to the sea as water-soluble Fe+2. Alternatively, or in addition, both iron and silica may have been derived from submarine magmatic and hydrothermal activity. Under calm, shallow marine conditions, the iron in seawater combined with oxygen released during photosynthesis by Cyanobacteria (primitive blue-green algae, which began to proliferate in near-surface waters in the Paleoproterozoic) to precipitate magnetite (Fe3O4), which sank to the sea floor, forming an iron-rich layer. It has been proposed that during periods when there was too great a concentration of oxygen (in excess of that required to bond with the iron in the seawater) due to an abundance of blue-green algae, the blue-green algae would have been reduced in numbers or destroyed. A temporary decrease in the oxygen content of the seawater then eventuated. When magnetite formation was impeded due to a reduction in the amount of oxygen in seawater, a layer of silica and/or carbonate was deposited. With subsequent reestablishment of Cyanobacteria (and thus renewed production of oxygen), precipitation of iron recommenced. Repetitions of this cycle resulted in deposition of alternating iron-rich and silica- or carbonate-rich layers. Variations in the amount of iron in seawater, such as due to changes in volcanic activity, may have also led to rhythmic layering. The large lateral extent of individual thin layers implies changes in oxygen or iron content of seawater to be regional, and necessitates calm depositional conditions. Iron and silica-rich layers, originally deposited as amorphous gels, subsequently lithified to form banded iron formations. The distribution of Lake Superior-type banded iron formations of the same age range in Precambrian cratons worldwide suggests that they record a period of global change in the oxygen content of the earth’s atmosphere and oceans. Also, the worldwide abundance of large, calm, shallow platforms where cyanobacterial mats flourished and banded iron formations were deposited may imply a global rise in sea level. Primary carbonate in banded iron formations may be replaced by silica during diagenesis or deformation. The pronounced layering in banded iron formations may be further accentuated during deformation by pressure solution; silica and/or carbonate are dissolved and iron oxides such as hematite may crystallize along pressure solution (stylolite) surfaces. Banded iron formations are highly anisotropic rocks. When shortened parallel to their layering, they deform to form angular to rounded folds, kink bands, and box folds. Folds in banded iron formations are typically doubly plunging and conical. Banded iron formations may interact with hot fluids channeled along faults and more permeable, interbedded horizons such as dolomite during deformation. This may remove large volumes of silica, resulting in concentration of iron. Iron, in the form of microplaty hematite can also crystallize in structurally controlled sites such as fold hinges and along detachment faults. If there is sufficient enrichment, an iron ore body is formed. Iron may also be leached, redeposited and concentrated during weathering to form supergene iron ore deposits. 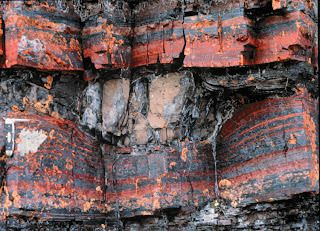 Fibrous growth of quartz and minerals such as crocidolite (an amphibole, also known as asbestiform riebeckite) commonly occurs in banded iron formations during deformation due to dilation between layers, especially in fold hinges. Replacement of crocidolite by silica produces shimmering brown, yellow and orange “tiger-eye,” which is utilized in jewelry and for ornamental use. © Denis Finnin, American Museum of Natural History. This photo was taken by Bob Osburn during a 2006 Physical Geology field trip. Source: World of Earth Science, ©2003 Gale Cengage. All Rights Reserved.